During the last weekend of September, I decided I was going to ‘help’ my university friend Katie out, by going to Paris with her as her travel buddy. After managing to swap shifts (with some very lovely colleagues) at the last minute, I bought my plane tickets to Paris. Now this would be my third time to Paris, and what I think will be my last time for a while, but it was still a milestone for me. It would be my first time flying solo since I was 20 and the first time in two years that I’ve spent longer than a night away, from J. And even though it was my third time, I did get to experience Paris in a totally different way. 1. Staying in a hostel. 2. Travelling with a friend (not a boyfriend or Mother). 3. Staying in a different arrondissement than the two previous times there. 4. Flying in an out of Paris. 5. Climbing up the bell tower of Notre Dame cathedral and seeing the infamous gargoyles close-up. 6. 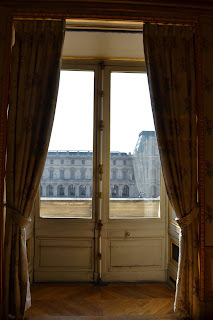 Seeing the apartments of Napoleon the third’s Minister of State in the Musée du Louvre. 7. Going to the Centre Pompidou. 8. Using my British Passport, to get into tourist attractions for a cheaper fee or for free. 9. Not climbing up the Eiffel Tower. 10. Not doing a bike tour of Paris or a river cruise of the Seine. After saying ‘see-ya later’ to J that morning, I made my way to Edinburgh International Airport all by myself and I was already indulging in self-pride in just doing this without him by my side. Later that day I also took a train and two metro stops (by myself) to get to Volontaires – the metro station around the corner from the Aloha Hostel, where Katie and I were staying for our long girls weekend. Following the easy to use directions from the booking website I found my way (J would’ve been proud). After checking-in to the hostel for both Katie and I, I made my way to the first floor and into our four-bedroom dorm we were sharing with god knows who. I only had to wait around an hour before Katie arrived, right behind me. After taking a little longer than usual to freshen our dreary just-travelled looking faces we then headed down to reception to pick the brains of whoever was there, about the shuttle buses to the airport and about what cabaret show we should see while we were in town. But after waiting an abnormally lengthy amount of time to speak to the receptionist and been given a disappointing response, we left the hostel later than what we had wanted to. We followed the directions of our trusty tourist map of Paris as best we could to find the looming Eiffel Tower. After coming to almost a halt at the corner of an intersection, we saw the infamous tourist attraction poking out above some beautiful parisienne flats, and stopped to take some photos. By the time we arrived under the tower, where you can buy your tickets we had decided to leave it to another day to climb the stairs to the very top; especially because Katie was unsure if the height would make her nervous or not. So instead we found the closest food cart (I didn’t care how expensive it would be – I was hungry) to have crepes; one of my favourite French specialities. And we ate them by the River Seine, with the on-the-hour light display flashing in the background. Of course we didn’t get up as early as intended and of course we didn’t leave the hostel when we had meant to. We made our way through the Jardin des Tuileries, stopping every so often to take photos and to take in the size of the museum we were about to visit. We made it to the Musée du Louvre around 11AM, which isn’t bad, especially because there wasn’t any queue. It was my third visit to the Louvre this time, but the first time I got in for a cheaper rate, because I was carrying my British passport around. I told Katie that you have to have a game plan, going into this labyrinth of a museum; see the famous sights or wander around aimlessly and get lost. Katie obviously not having been there before, wanted to see the famous exhibits, which of course means going to see the Da Vinci’s. I have to say it doesn’t matter how many times I’ve seen the same painting, in the same museum, it’s still a ‘pinch-me’ moment. This time though, I couldn’t get over how busy it was around Leonardo Da Vinci’s paintings that are featured in the main gallery; The Virgin and Child with St.Anne, St.John the Baptist, Virgin of the Rocks, La belle ferronniére and Bacchus. I don’t know if I can remember it being that busy the last time I’d been, especially around the Mona Lisa. So apart from the main things I’d seen before, the exhibit that I was definitely keen to see this time round was the Napoleon Apartments. But first lunch was needed. So Katie and I stopped in at the museums cafeteria. 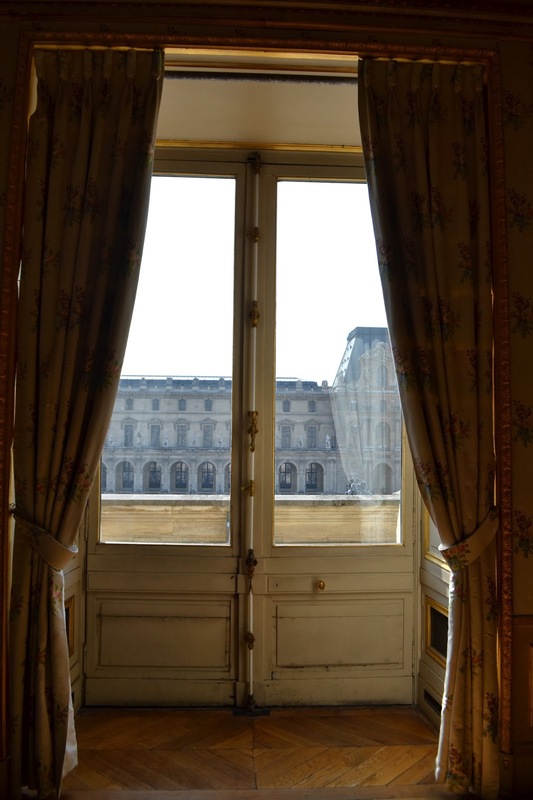 I’m glad we went over our time that we budgeted for the Louvre to see the Napoleon Apartments; my god they are breathtaking. Its like stepping into ‘la belle époque,’ when walking around the rooms each with a chandelier bigger than the room you just came out of. After the Louvre, we headed to the Arc di Triomphe to watch the crazy French drivers around the round about, and to hear all that honking they were doing on their car horns. Then next was Ladurée – for macaroons of course! I’d never been to the big one on Champs Elysee, though they are dear compared to other places and Ladurée is quite touristy, the flavours that you can taste in those macaroons is worth the expense. We bought three each; mine was gingerbread, rose and Columbian chocolate… definitely, definitely worth it! Turning the rest of the day into a French-food-frenzy, I took Katie to a street J and I only accidentally came across last year, but, that everyone else seemed to of heard of before; Rue Cler, a street not far from the Eiffel Tower and the perfect place to shop for the picnic necessities. Katie and I bought salami, a baguette, cheese and pastries and sat ourselves down in the garden, in close proximity to that looming French symbol to eat our picnic goods and watch the sunset slowly. When we finished; the night was still young, so we headed back to the hostel and donned the best dresses we bought with us and put on some red lipstick and headed to Le Paradis Latin, a cabaret show, that has history dating back to ‘la belle époque.’ Though the tickets (at the time*) were the cheapest we could find, for a slice of this parisienne nightlife, the champagne certainly was not. It was €12 for a glass of champagne!!!!! Other than that we enjoyed the show and our surroundings. I can’t say it was better or worse than the Moulin Rouge, which J and I had the chance to see last year. But it was definitely worth our while. After the show we then caught the metro back towards Rue Cler – but this time for a glass of wine and the parisienne tradition of ‘people watching.’ Not the first bar, but the second is where we sat, facing our favourite village-like street. Instead of ordering cocktails (which this bar seemed to be known for) we just ordered a glass of house white each (still pricey – but much cheaper than the cabaret counterpart). 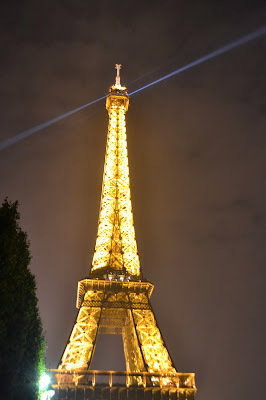 Then our night ended with us walking back to the hostel and passed the luminous Eiffel Tower. Once we made it back to the hostel though, we were shocked when we were confronted by a little commotion* and a fellow traveller asking us, “Did you hear a girls scream?” Not something you want to hear when you’re about to enter your dorm room that you share with complete strangers. We were both excited to be going to Notre Dame on our second day in Paris, especially to see the gargoyles at the top. 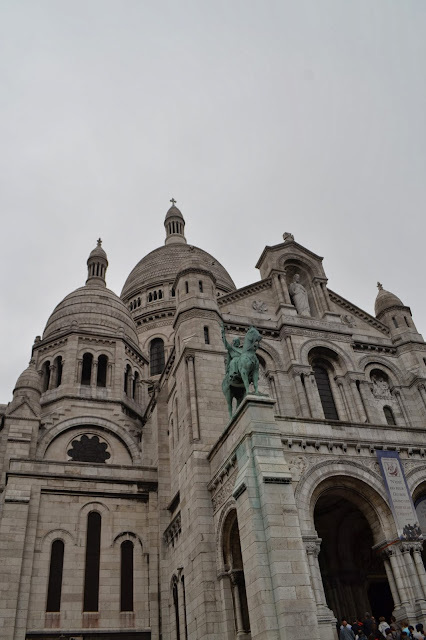 After walking through the Latin Quarter – we arrived at the gothic cathedral, where at the front there currently stands a huge blue sign that tells you the building is celebrating the complete refurbishment of the 850-year-old building. Though the queue moved quickly to go inside, the line (once we were in it) to go up to the Bell Tower* creeped along very slowly. We probably waited an hour (a reason I had never gone up before). But luckily, with our ingenuity, Katie and I had packed our lunch – salami and cheese leftovers from our Eiffel Tower picnic and mini-baguettes the hostel left out for guests. So at least we could eat lunch while we waited for the line to move along, as we were time strained. Apart from the smog ruining the distance you could see across Paris’ skyline. It was so good to see the gargoyles so close-up. Gee whizz Disney did a good job on the gargoyles in the movie. Katie also didn’t find the height overwhelming, which was good. After walking through the gardens at the back of the church, we crossed the ‘love lock bridge,’ the one covered in padlocks, otherwise known as Pont de l'Archeveche and I showed Katie one of my favourite book shops in the whole world, Shakespeare and Co. And talked her ear off about all the history I had learnt* about the place since I had been there last year. Then it was time for a tea and cake break around the corner at a bakery J and I had visited last year and loved the sizes of cakes that you could get there. Now that we had done a pretty good tour of the Latin Quarter, it was time to try and get our butts to the Centre Pompidou, a definite first for me, and as it was highly recommended by a mutual friend of ours, we just had to go. Though we didn’t leave enough time to see it all and one of the exhibits was closed, we decided to go in anyway, especially because I not only got in for free but my passport was also the passport for Katie to get in for free too. So we wandered for about an hour on Level 4, looking at contemporary art from the 1960s up until now. Whilst we were looking around, my phone died of battery, and I was in a panic because I couldn’t get in touch with my friend Vivian (who was on a work trip from Hong Kong), whom I was supposed to try and meet up with that night. Once we finished up at the Centre Pompidou we headed back to the hostel, to get dressed up and then we caught the metro to one of my favourite areas, Montmartre to go for dinner at restaurant that J and I discovered on trip advisor and that I wrote about in my last blog entry on Paris, Le Refuge des Fondues. A restaurant not just famous for its shared dining experience, or the Swiss delicacy, but for serving wine out of baby bottles. An experience that Katie (her first time) and I (my second time) both quite enjoyed. The thing that makes this dining experience, is not just the slightly squirmy idea that you’re drinking wine from baby bottles, but that it forces you to talk to your neighbours at the table. We met the people we sat next to in the queue waiting to get a table, after I said to the guy in front of me who was at the time pouring wine into a plastic cup for him and his girlfriend, “what a great idea,” And he followed by telling me that he got it from a corner store up the road. Where I proceeded to go get Katie and I a bottle of wine to share too. We then started talking to the couple in front of us; and found out that they were Dutch and Norwegian who met at school in Spain. And then we got talking to the girls behind us who were from America and all studying French at the Sorbonne. In my eyes it’s definitely the perfect place to come to for dinner, if you are a real traveller at heart. Dinner ended pretty late, and after realising that we were a bit tipsy, we decided to change our idea of walking up to the top of Montmartre to see the view from Sacre Coeur and instead went to Moulin Rouge for a look and then headed back to the hostel. The next day after smelling the smoggy air whilst climbing up Notre Dame and the combination of drinking too much wine, I felt really rubbish on our last morning and I was dreading my lengthy trip to get to the Beauvais-Tilleairport (where the budget airlines fly from). But before we left ‘the city of love’ we decided to finally go see the view from Sacré Coeur. Not that it was a particularly lovely day. But its still one of my favourite experiences in Paris and I had to show Katie. 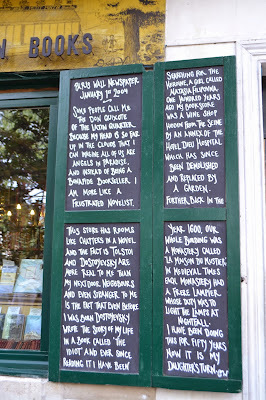 And it was also a great place to buy last minute souvenirs. So after walking up Montmartre and taking photos, we stopped to buy said souvenirs and to also have one last taste of some crepes. Once getting back to the hostel, Katie and I said our goodbyes (because I wasn’t going to see her until I was next in Brisbane probably) and then I caught the two different metro lines and then got on the shuttle bus in the worst state I’ve ever travelled in. I was so glad to get home to Edinburgh and to see J at the airport. *I bought the latest edition of Lonely Planet Traveller magazine and they featured a ‘mini guide’ on Paris’ nightlife and I saw a cabaret show Au Lapin Agile, and I so wish I saw that before hand. It sounds more like what Katie and I expect from going to see a cabaret show in Paris, as they sing French songs in 'French' and not in English for us tourists. *Turns out the scream this guy and others had hears was probably nothing, as nothing came of it in the morning. Though some ‘crazy’ guy did attack another guest outside the entrance to the hostel and the Police were called. *The Notre Dame bell tower is also one of these tourist attractions that is free if you have a EU passport. *This past year I read Time was soft there: A Paris sojourn at Shakespeare and Co., written by Jeremy Mercer, which gave a really interesting history about George Whitman and how the keys got handed down to his daughter. It was well worth the wait. Your writing is brilliant I love your style. I look forward to one day maybe you compile a book.